The poems presented on this Web site, www.amittai.com, are the property of the author, Amittai Aviram. All rights are reserved. Copyright © 2002. This material is not to be copied or distributed for profit without the express written permission of the author, Amittai Aviram (amittai dot aviram at gmail dot com). The author's name, e-mail address, and Web site URL MUST appear on any material copied from this page or this Web site, whether that copy take a printed or an electronic form. By scrolling or otherwise viewing the contents of this page below, you are signifying that you agree to the stipulations stated above. If you copy any poem or any part of any poem from this Web site, please make sure that my name, e-mail address, and URL are in your copy, and please make sure that any person receiving the copy knows likewise to include these items in any further copies. 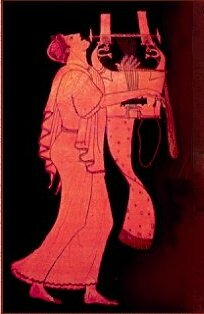 Image left: Ancient Greek vase painting of youth playing lyre, courtesy New York Metropolitan Museum and Encyclopaedia Romana. This page © 2004 by Amittai F. Aviram.